FROM I-35: Take Exit 42 off the I-35 toll road; after passing through the toll booth, continue straight on to 47th street; turn right (east) on 47th street for about 3.5 miles; left (north) on Rock Road for approximately 2.5 miles to the main gate on the left. Proceed through main gate and proceed down Kansas St. to first light and turn left, go to the end of the road (past shopette) and turn right. Take the road just before the water tower and go between the tower and the fence, when this road turns south at the next fence you will see the Famcamp about 1/4 mi ahead. ---- FROM KS TURNPIKE, take the Kellogg exit west approx. 0.5 mile to Rock Rd. South on Rock Rd 2.5 miles to Main Gate (on right). Proceed through main gate to first bldg. on left (#196) to check in. From check in proceed down Kansas St. to first light and turn left, go to the end of the road (past shopette) and turn right. Take the road just before the water tower and go between the tower and the fence, when this road turns south at the next fence you will see the Famcamp about 1/4 mi ahead. Allowed with usual leash and clean-up rules. Shot records required for dogs. Bring the records with you to when you register. 2 FamCamp areas and a primitive camping area. Dump station available at nearby famcamp. Register for the FamCamps at the Base Lodging (Capital Inn). Register for the primitive area at Outdoor Recreation. Paint ball, disc golf, archery range, driving range, walking/running trails. Posted at gate: &amp;amp;quot;No Fireams&amp;amp;quot;. 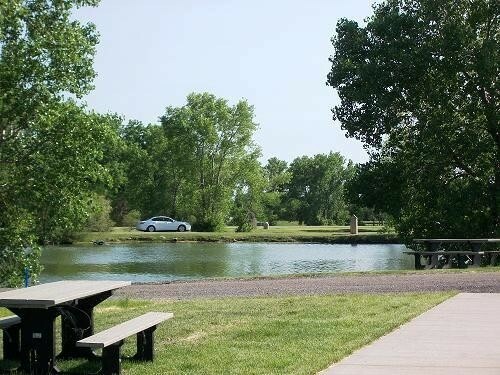 Outdoor Recreation proudly manages Krueger Recreation Area, more than 160 acres devoted to your recreational enjoyment. 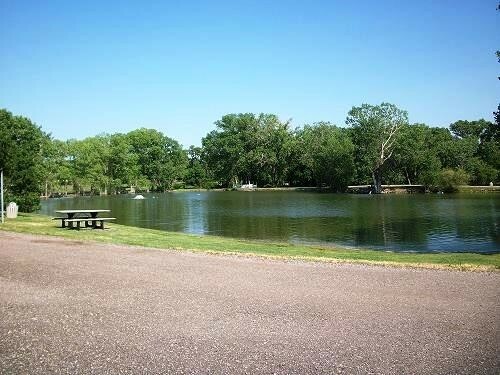 Activities include a driving range, disc golf course, archery range, RC car course, ATV and Paintball courses, family camping, fishing ponds, and picnic areas. 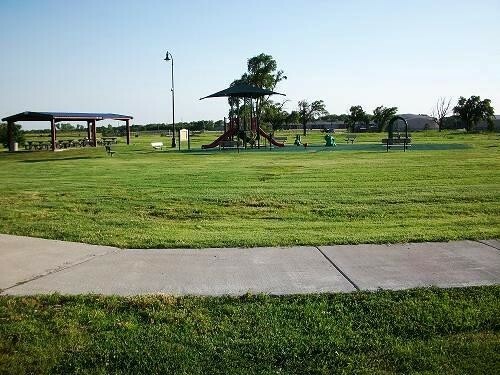 Outdoor Recreation provides all of the equipment needed for the activities at the Krueger Recreation Area. Our check in process was a circle jerk. I don't want to take away from the rating of the park, but I have to mention our check in process. We went to the park before we went to Air Capital Inn because we missed it (Air Capital Inn) while driving in. I called them once we reached the park because there is no host or office. Rather than tell us where to park and go to Air Capital after we set up they told us we had to pull the rig back through the base to check in. And, I would mention, the parking lot at the Air Capital Inn is NOT big enough for a big rig. Then they wanted the vaccination records for our indoor cat. Those records were under the bed and I needed to get the slide out to get the records. He actually hesitated to allow us to go set up and bring the records back to him. As it was, he gave me 30 minutes to get back to him. As for the park....it is very nice and small. 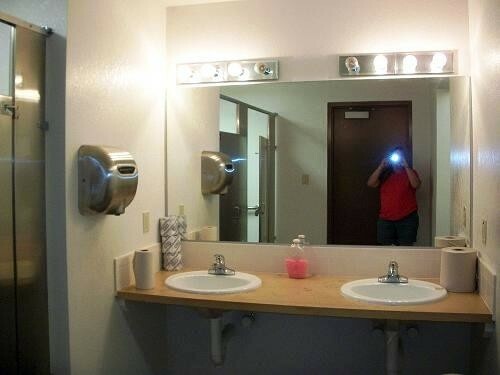 There are 10 spaces and all pull throughs set at a good angle and utilities were convenient. 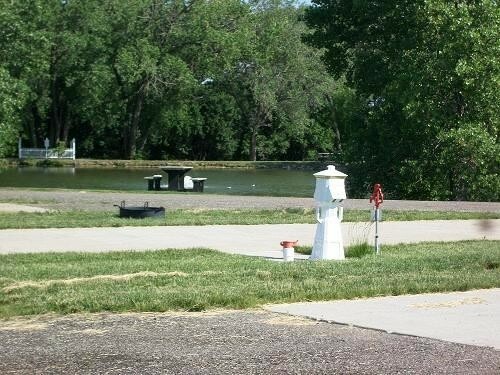 They have 2 tornado shelters on either end of the park, a pretty little pond for catch and release, 2 pavilions for gatherings, and a very large park-like setting on the other side of the park with a walking/running track. There is plenty of room between each site. There is no wifi, but Verizon had a good signal for hotspot. It is also open for good satellite dish reception. My only complaint about the park is that by the time we left after 7 days, the grass was close to knee high. 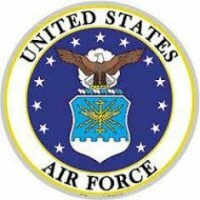 That surprised me - especially for an AFB. I really have no complaints about the park - just the check in fiasco. Must be something with AFB FamCamps...Becoming the norm for bad/low budget facilities. 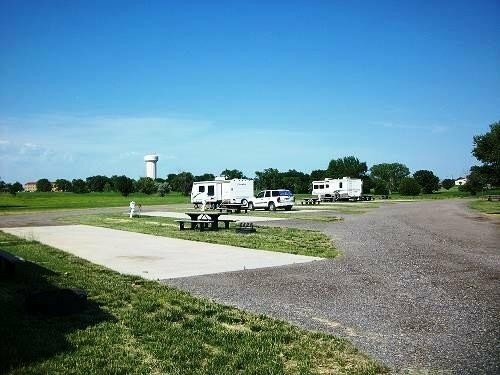 Even though there is full hook ups and could be great places to visit and/or stay, it seems as though the AFB Outdoor Rec personnel have little to no care about the FamCamps. Grass is ridiculously high and with the ponds near by, its a breeding ground for the mosquitoes that are waiting in swarms. Asked if they could bring me a lawnmower to use and was told they should be down here in the next few days to mow as they didn't have enough people employed to maintain it. Also, was told they wouldn't spray for the mosquitoes due to being afraid it would harm the dogs and cats. Called the check in office only to be placed on hold for over 30 minutes and finally hung up and went to the office. No base map, local map(s), or information was provided. Had to ask for a key card for the laundry room. Issued an algae warning about the ponds and had to sign a paper about providing shot records for our pets or they had to stay in off base kennels. Its obvious the command has little to no concern about the image being left at the FamCamp or they would step in and demand better upkeep and management. I just recently sold my house & decided to travel full time now. My family been traveling now for almost 2 months, been in 4 Military Campgrounds, I would say that McConnell Fam/Camp offers the most. It is my very first time experience in military campground & I never find FREE LAUNDRY from any other Campgrounds, but McConnell. It is a big thing when you are traveling with 4 other persons. McConnell also offers free fishing without requiring any state license which my kids had a blast. The very nice bath house/ restrooms/laundry also housed a FREE ICE cubes which I found it very helpful in many ways. No other campground offers this kind of freebies. Yes, this place could use tree shades, but it compensates in other ways. I loved their 2 miles rubberized padding pathwalk. 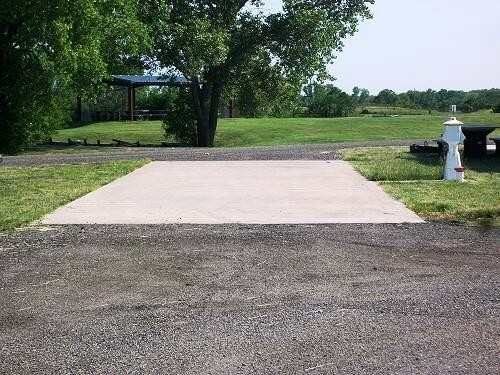 It makes my morning run so easy & it runs right behind the RV park. I would definitely come back. Very nice new campgrounds. The only drawback (reason for a 4) in my opinion is the lack of shade and the height of the sewer drain connection. It's a chore to get the hose drained when breaking camp. The new sites are located on the old Twin Lakes golf course. Some of the cart path has been turned in to a fitness trail. Signs have been added that direct you to the new sites. 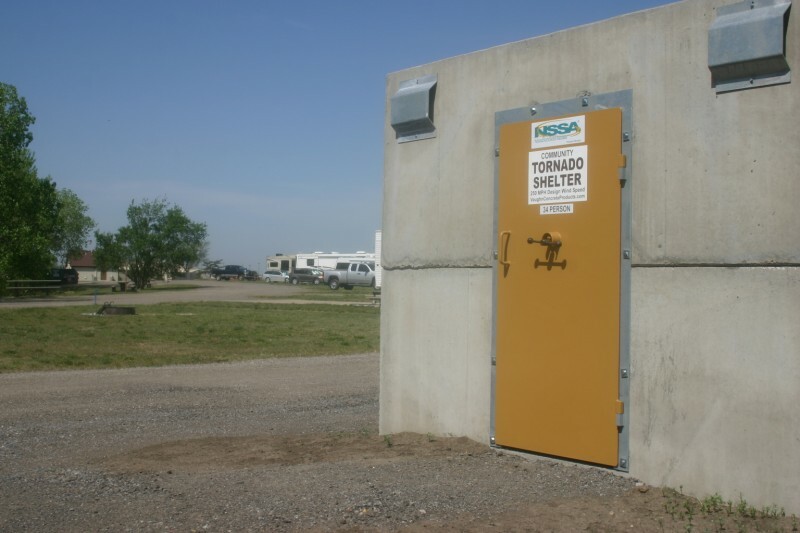 There are two new tornado shelters located close to the sites. There's also a commercial size ice machine in the laundry facility. Make sure to bring your dog's shot records in to the Air Capital Inn when you register. The Rock Road gate is open 24 hours. A sign instructs RVs to take the far right lane upon entry. Reservations taken at the Air Capital Inn were quick and easy. Al sites are pretty much the same, no shade in any of them. Nice playground if you have the kiddies with you. 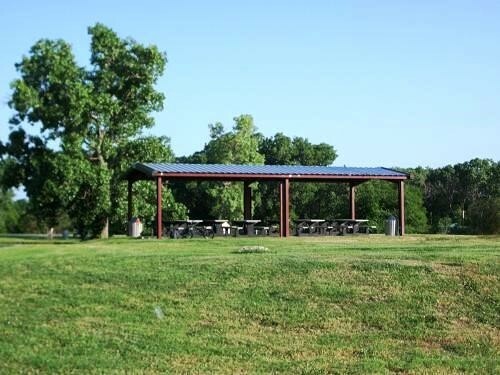 Also, nice large covered picnic area available close to the sites. A reservation (recommended) was made and check-in at Bldg 196 Air Capital Inn, which is required, went very well. The staff was very friendly and knowledgeable about the Fam Camp. A map was provided for directions to the FamCamp. There are no direction signs from the Air Capital Inn to the FamCamp. It's very easy to miss the turn that takes you on the east side of the water tower on Mulvane Rd and also the turn that you must take to the right on Russell Rd after you pass the Outdoor Rec office Bldg 1349. There is no sign for directions to pull in to the right to the sites off of Russell Rd. The new lighting on Mulvane Rd is really a great improvement all the way down to Russell Rd. There is no lighting in the FamCamp other than the lighting on the electrical posts. The 10 sites are all pull-thru and the full hookup utilities for the sites are well positioned on the 15' x 60' cement pad. Beware that the water pressure may be pretty high. It was 80+ psi at the time I set up. The top of the sewer drop is approximately 10" above the ground which makes it a challenge to get the sewer hose put in place so it will drain. 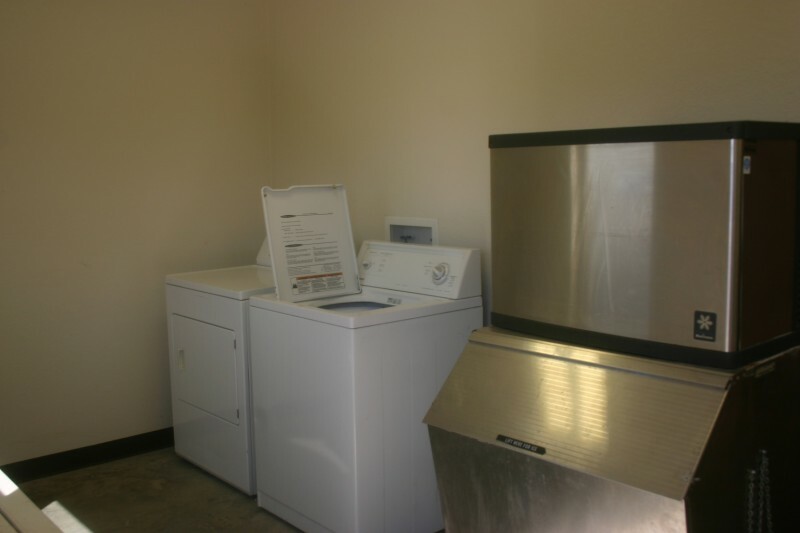 There are two pair of free washers and dryers in the laundry/shower building which is located at the FamCamp. A pass key can be obtained at the Outdoor Rec office Bldg 1349. Satellite TV reception is not obstructed by any trees. There is no WiFi. 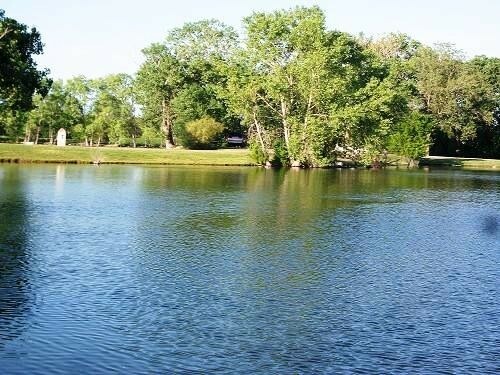 There is a small lake with catch and release fishing available. There is a new playground. The Commissary is of average size and the remodeled BX is small but adequate. There is no diesel fuel available on base. 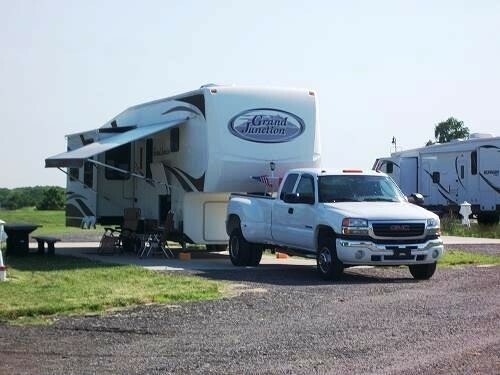 This new FamCamp is now a convenient place for an overnight or an extended stay. Stayed here 3 days on our way north. You can make reservations. Very quite and relaxing. I totally agree with the prior poster, Very nice rec area. We have a 40 ft. 5th wheel and fit in easy. All sites pull through. Has a 2 small ponds. Had water, electric, & sewer hookups at our site. Direct TV, Verizon cell & Internet worked great. Paid $18.00 per night. FamCamp is on base and easy to get to. Check in is at the Air Capital Inn, 3rd right once you are through the gate. Not far from shopping and dining out. Washers & dryers free. I'm not a numbers rater, either I like a FamCamp or not. Well I like this FamCamp. Will stay here again. We stayed here in a Motorhome. 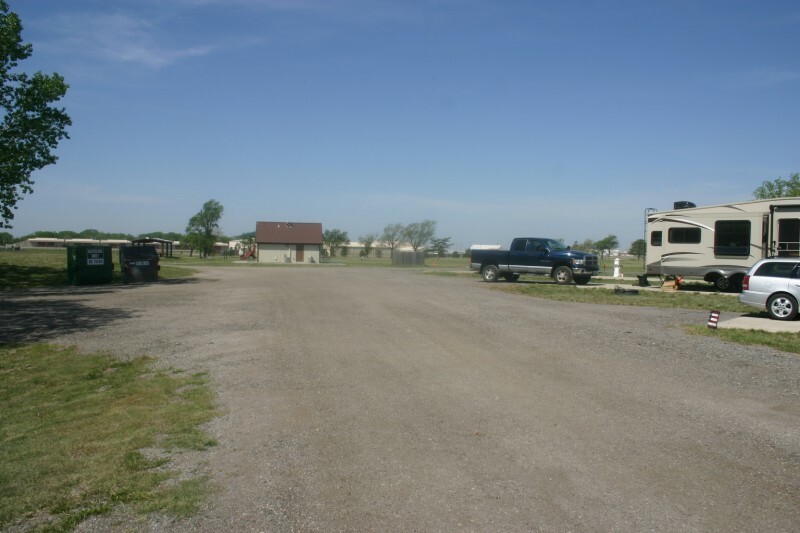 This campground is so much better than what they had, the spaces have a 60' concrete pad and the entire spot is approximately 80' with gravel at each end. Each spot has a picnic table and fire ring. There is a playground for the kids, laundry and bathroom/shower facilities. In a conversation with one of the outdoor rec folks I was told that there are plans for 10 more spots, all the same size as the current ones. The plan also includes the closing of the older camp. 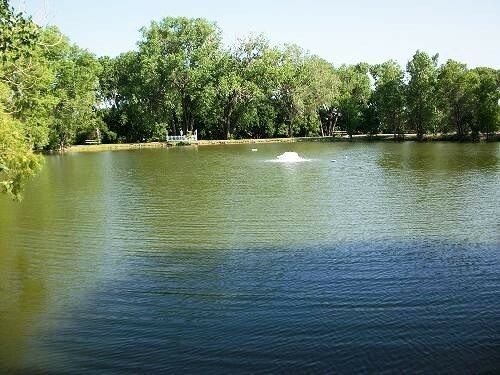 The two ponds have fish, catch and release only, and no license required. Check in is at the Air Capital Inn not outdoor recreation. Access to the laundry is at outdoor recreation where you get an access card for the reader on the laundry door, there are two washers and two dryers, all free. 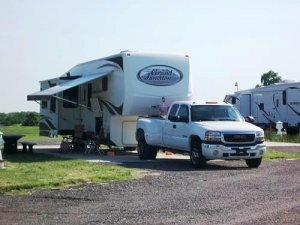 The famcamp is big rig friendly. We had good satellite and Verizon WiFi reception. I will stay here again when I'm in this area. This famcamp is one of the better campgrounds in my experience.